PASADENA, CA-Down goes the champion! Turn the ball over and your chances of winning become a lot slimmer. If you are a football team turning the ball over four times in a quarter, it’s a good bet that you’re going to get smoked. That’s the recipe Oregon used in putting up a Rose Bowl record in points as the Ducks moved with rapid precision in posting a 59-20 beat down of Florida State to advance to the national championship game against Ohio State on Jan. 12. Oregon may very well have won this College Football Playoff semifinal game with the same ease as it showed, but Florida State helped put them in position to stop their 29-game winning streak by committing four fumbles in a 15-minute span that translated into 27 points for the Ducks. The costly turnovers were a big reason why Florida State couldn’t make any real adjustments after intermission. “It was the turnovers,” Florida State coach Jimbo Fisher said. “It was different because, when turnovers come, they change momentum. Momentum is different than making adjustments when guys are driving the football. If we can put the ball in the end zone on offense, it can help our defense out in a lot of situations. “Transition defense we didn’t excel at. I thought the end of the first half they were playing very well. I felt comfortable coming out in the second half. I thought defense had played pretty well. Florida State quarterback Jameis Winston, who won the Heisman Trophy as a redshirt freshman and led the Seminoles to a win in the national championship game last season, said just losing hurts all the way around. 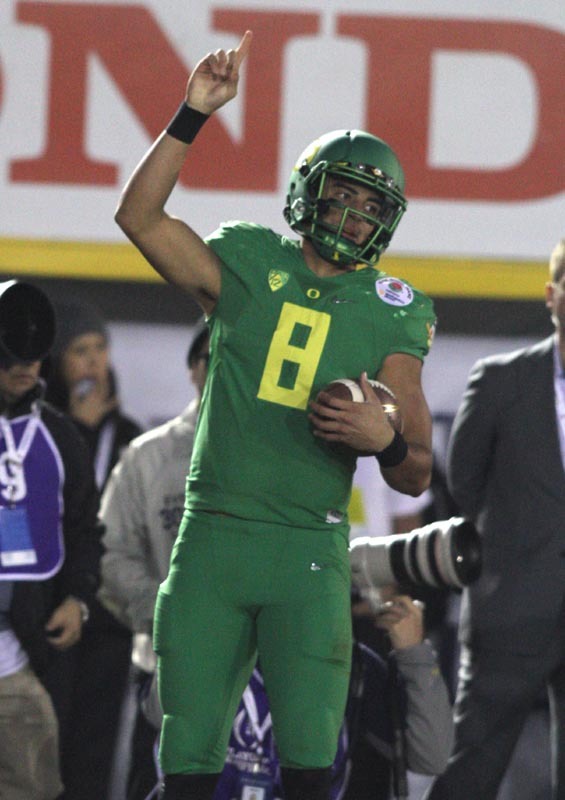 Oregon quarterback Marcus Mariota definitely has something to smile about with the kind of season he has produced. Against Florida State, there was no Heisman Trophy jinx this year. Of the 639 yards in total offense Oregon ran up on Florida State, Mariota accounted for 400 in an all-around effort that saw Mr. Heisman Trrophy winner throw for 338 yards and two touchdowns, while adding another 62 on the ground with another score. Too many turnovers, too much speed and just being too good allowed Oregon to erupt for 27 points in the third and decisive quarter to topple Florida State in the Rose Bowl Game presented by Northwestern Mutual. The third quarter had to be the worst quarter Florida State coach Jimbo Fisher had to endure as the Seminoles turned the ball over four times in the period as the Ducks took their high-stepping game to another level in blowing open what figured to be a closely played contest if you judged how the first half went. The sequence of errors in the third and fourth quarters took the sail out the Seminoles’ sail to a possible second national championship. If Winston and the Seminoles liked their chances with a just a 18-13 deficit at halftime, they probably had to look the other way in dismay in the final two periods as they watched Oregon pop the unbeaten balloon they had been riding on for the last two years. A relatively close 18-13 lead turned into a 45-20 advantage by the time the third quarter ended mercilessly for Florida State. And that was the ballgame. For a moment, it looked like the fat lady was going to sing when Florida State stared down a 25-13 deficit early in the third quarter with the Seminoles needing to convert a third and forever play to keep the drive moving and not give Mariota a chance to put the dagger in. Well, there is a reason why Winston won the Heisman Trophy. On third and long, Winston threaded a perfect, NFL-type throw along the sidelines to Jesus Wilson to keep the drive alive. 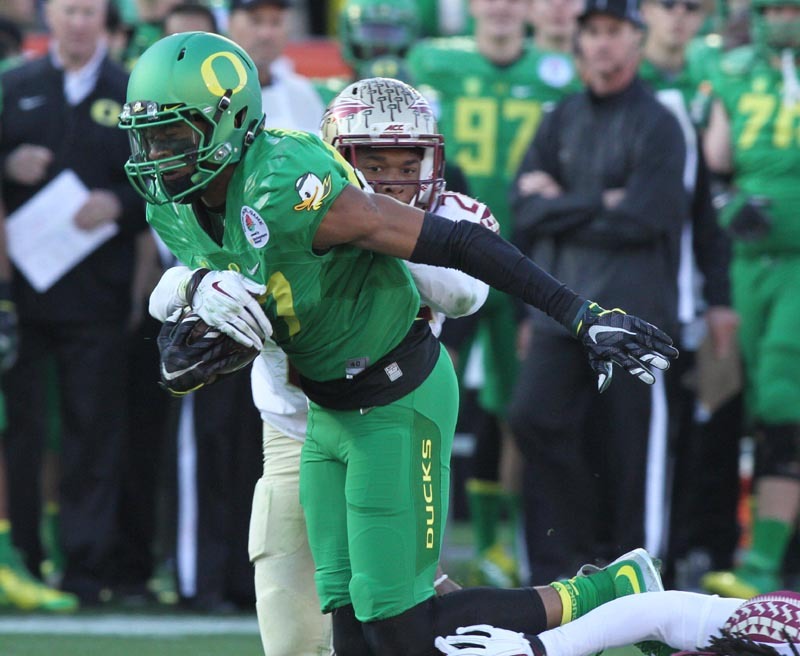 On the same series, Winston found Wilson again, this time for a 18-yard touchdown pass to cut Oregon’s lead to 25-20. But that’s when the fat lady decided to take the stage, brush up on her vocal chords and wailed away, handing Florida State a lesson in concert humility.